The Arthritis Cure™ (Revised 2004) is a book that's certain to change millions of lives forever. The Arthritis Cure tells of a real world medical miracle - an advanced treatment program for the number one cause of chronic pain and disability. "Arthritis treatment will never be the same." 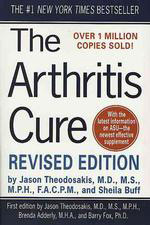 Buy Dr. Theo's® "The Arthritis Cure™ - Revised Edition "
 FOREWORD by Amal K. Das, Jr., M.D. 1 Can Osteoarthritis Be Cured?